Looking for a good nights sleep? Well you are looking in the right place!! Our handmade bed are designed and crafted to ensure you have a comforting sleep. It is made from solid wood, high quality fire resistant crushed velvet material and consists of outstanding quality of foam backing, all of this means that our bed is built to last and will guarantee a tremendous amount of comfort and a great sleeping experience. 1 x Set of slats. Excellent quality of fire resistant crushed Velvet Fabric. Outstanding quality of foam backing. Available in range of colours e. Black, cream, grey and etc. All our beds are flat pack and come in 4 pieces. All brackets are pre attached. Remove all packaging from the beds. Screw the chrome legs onto the bottom of the headboard and footboard. Hook both the side rails on to the headboard. Tighten the bolts using a 14mm spanner. Place the middle support in centre of the bed. Spread the slats evenly across the bed and drill the screws on both sides and the middle support. If you are wanting a bespoke size of bed then just message us about it and we will happily have it arrange for you. If you live in a flat then could you please make sure that the courier have access to ground floor so you are able to receive the bed, however the courier are unable to take it anywhere other than the ground floor. Images and photos are all purely for illustration purposes only. Please do not dispose your old bed/mattress until you havent received and set your new bed up. We only deliver to confirmed addresses and if you provide us with an incorrect postcode or address then this will cause delay to your order. Unfortunately we are unable to give you a specific time so it is important you check the tracking information, however we will inform you day/night before that it is going to be delivered the following day. We are sorry but we are unable to deliver to Northern Ireland. All goods that are leaving factory are checked by us but if it damaged then we need proof to claim this from the courier company. We appreciate your support and understanding and also we will be very responsive to any issues arising in your order. If you are interesting in ordering in bulk then please inform us and we can arrange that for you. We look forward to doing business with you! The item "Chelsea Crushed Velvet Bed Frame" is in sale since Friday, November 30, 2018. This item is in the category "Home, Furniture & DIY\Furniture\Beds & Mattresses\Beds with Mattresses". 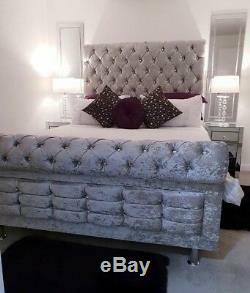 The seller is "hawaiibeds" and is located in Dewsbury. This item can be shipped to United Kingdom.